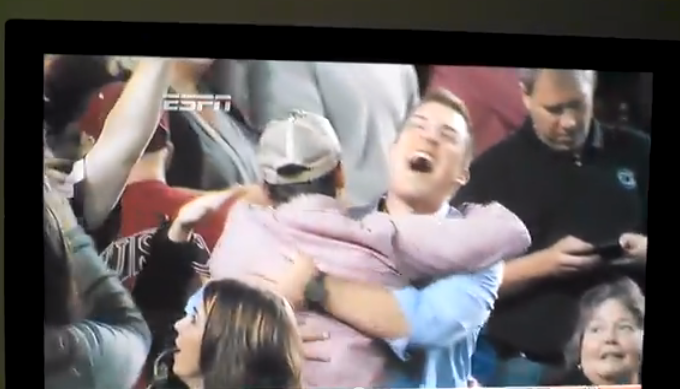 People were hugging strangers in the stands after the Miracle. South Carolina fans are just friendly that way. The Williams-Brice Stadium reaction to Ricardo Louis’ catch—which we’re now told WAS shown live, though during a commercial timeout—was caught on cellphones by people attending the South Carolina-Florida game. Turns out ESPN camera’s caught it, too, and eventually showed it during the broadcast. Related: Security cam footage of fans at Locos restaurant in Auburn reacting to the Miracle in Jordan-Hare.